Oscar Pistorius is a Paralympic bionic leg runner and record holder in the 100, 200, and 400 meters who wants to compete in the Olympics. 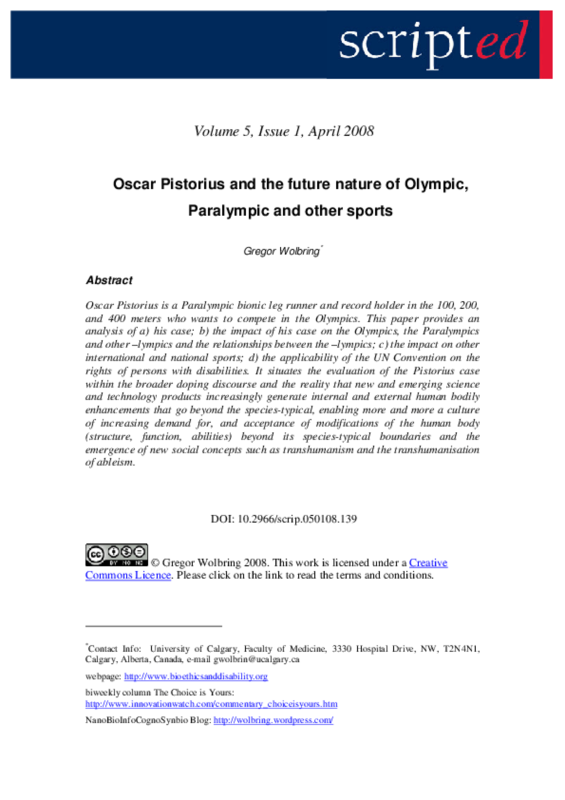 This paper provides an analysis of a) his case; b) the impact of his case on the Olympics, the Paralympics and other -lympics and the relationships between the -lympics; c) the impact on other international and national sports; d) the applicability of the UN Convention on the Rights of Persons with Disabilities. It situates the evaluation of the Pistorius case within the broader doping discourse and the reality that new and emerging science and technology products increasingly generate internal and external human bodily enhancements that go beyond the species-typical, enabling more and more a culture of increasing demand for, and acceptance of modifications of the human body (structure, function, abilities) beyond its species-typical boundaries and the emergence of new social concepts such as transhumanism and the transhumanisation of ableism.